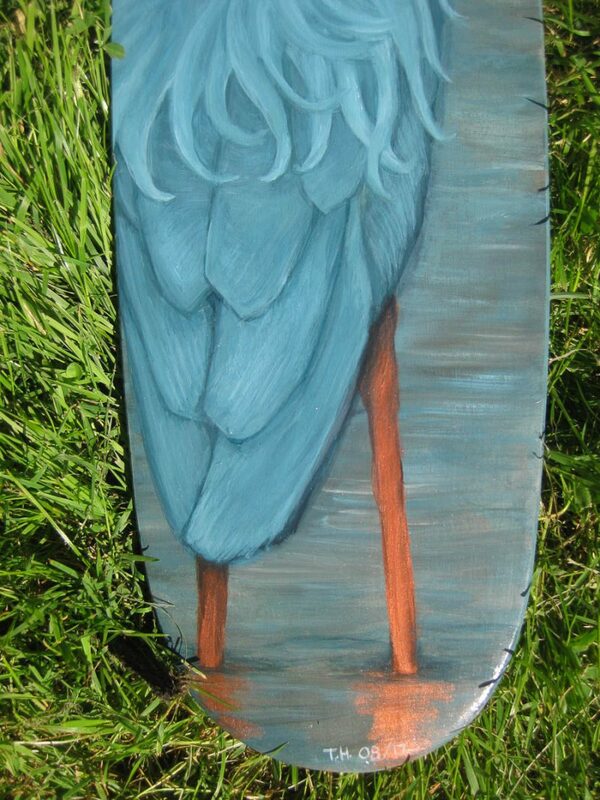 I have always liked blue herons. 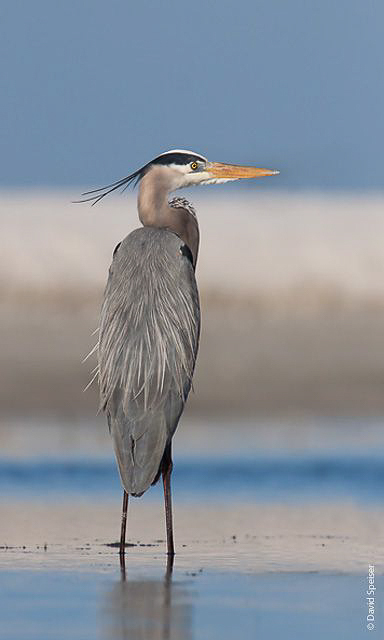 They are a majestic bird, and their presence – on a dock, in the water, flying over head – has always been an infrequent and special occurrence for me. 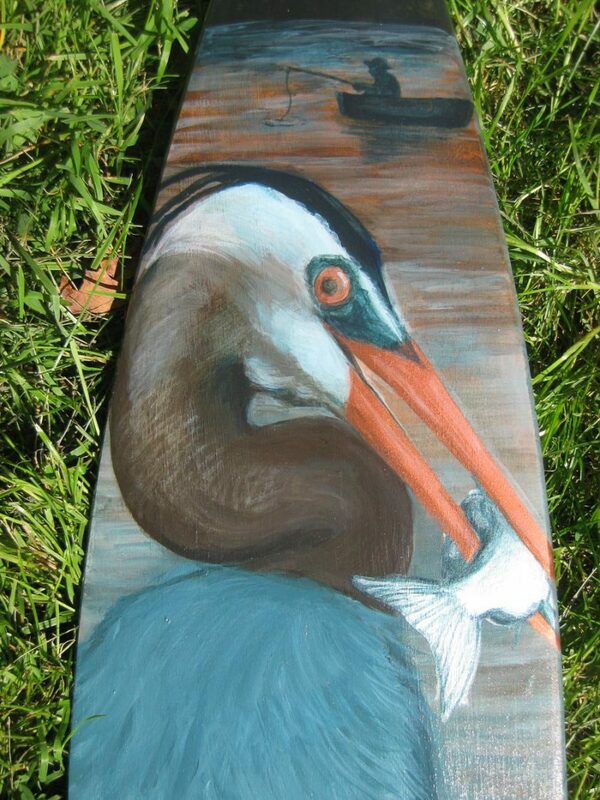 I attempted to capture some of the mystique of the great blue heron when I painted this paddle. 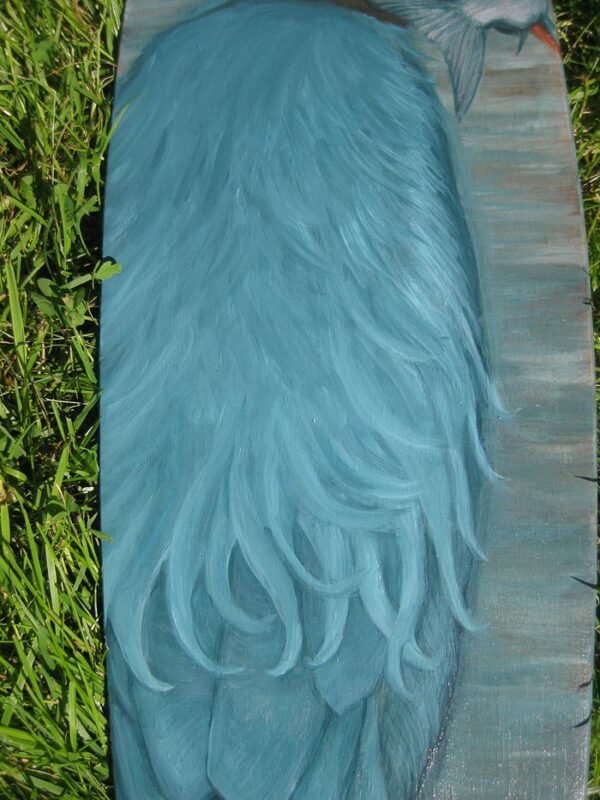 It did not occur to me right away to paint a heron, but the shape of the oar – tall and slender – helped inspire the idea. 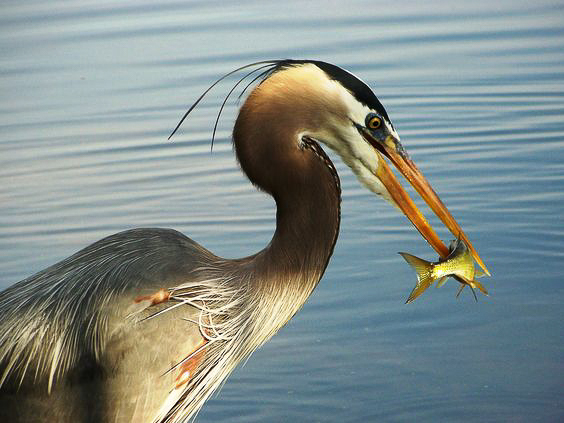 During my early visual research, I came across a photo of a heron with a fish in it’s mouth and liked the idea of showing a parallel between this wild bird fishing and a human fishing to show a connection – however distant – that we share. Once I had a solid vision, many artistic decisions followed quickly. To compliment the blue of the heron, I wanted to work with warm tones. 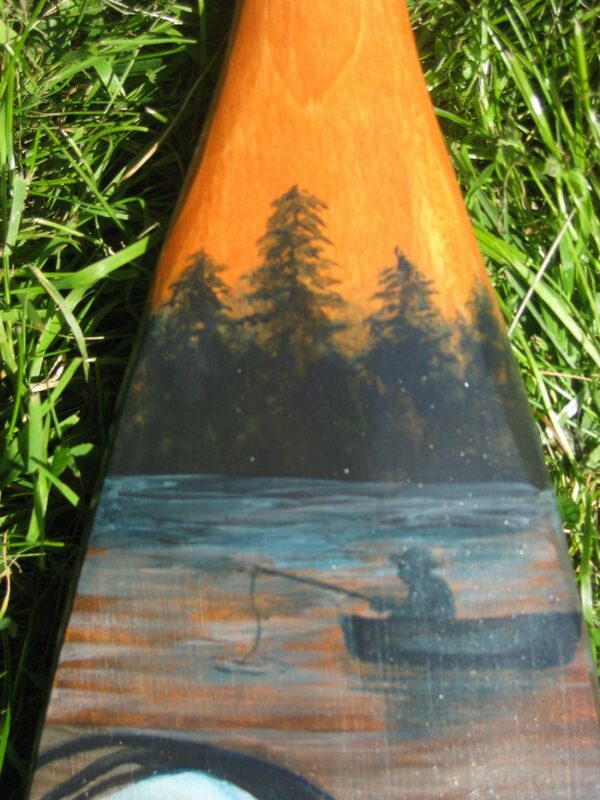 I decided dusk would be the perfect time of day to use warm tones and stained the paddle a burnt orange to start things off. For the heron, landscape and fish I used a handful of reference photos which was very helpful when it came to details. The hardest part for me was painting the feathers and this took more than a few tries to get ‘right.’ The easiest part was painting the silhouettes of the trees in the background, and the final reflections on the water. 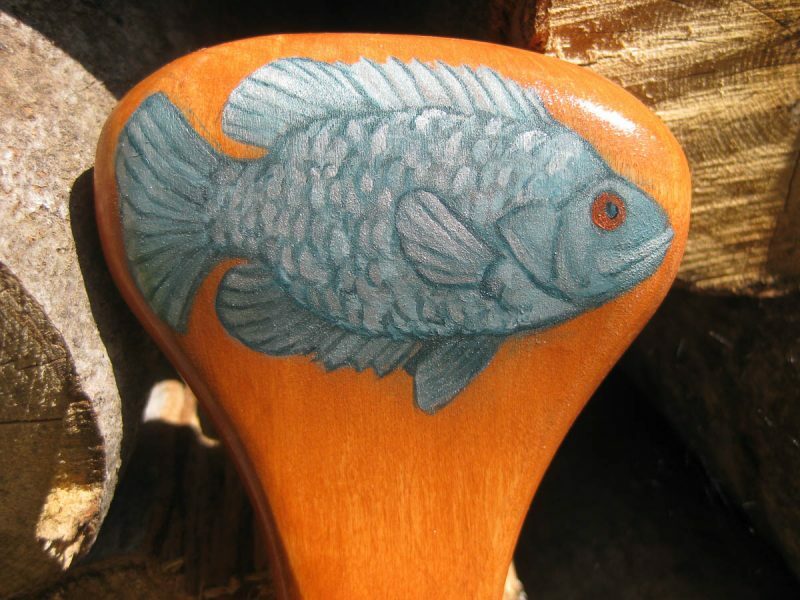 My final touch to the paddle was a little fish on the handle which I thought would be a fun accent. 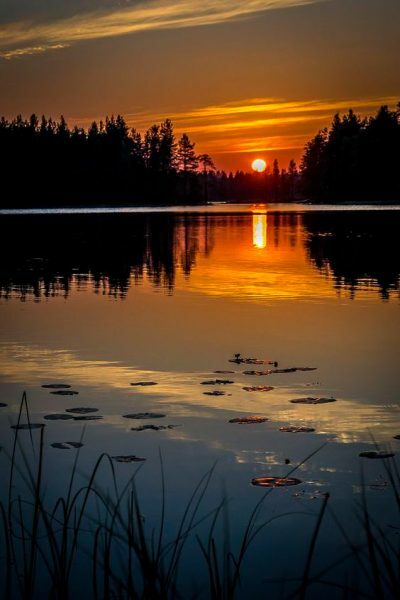 Altogether, from start to finish, the paddle took close to two months to complete. I have a ten-month-old baby, so much of the work was done after he went to bed. It made for some late nights, but through all the work and toil, I was able to bring my vision to life. I’m proud and very happy to be given the opportunity to include the finished product in the Algonquin Outfitters on-line auction commemorating the 100th anniversary of Tom Thomson’s death.